This seemed incredibly suspicious to me because an application with a final siting plan has not even been filed in this matter and not a single state or federal agency has approved any of the currently proposed environmental, economic or health impact studies submitted by Apex. Not a single sign-off, even after many, many months of review after Apex proposed its studies. In any event, I was very interested to know what environmental assessment reports the Sierra Club had reviewed, what studies it relied upon and what evidence had been looked at while reviewing the potential environmental impacts specifically associated with the Lighthouse Wind project. In November, I sent a letter to Kate Bartholomew, chair of the Sierra Club Atlantic Chapter, asking for any reports, studies or materials that were provided by Apex specific to the Lighthouse Wind project and for any conclusionary reports that were produced by the Sierra Club as a result of its review. I also sent a letter to Paul Williamson, project manager for Apex Clean Energy, asking him to provide any reports, studies or materials specific to the Lighthouse Wind project that were provided to the Sierra Club. Mr. Williamson replied to my letter and confirmed that Apex had not provided the Sierra Club with any materials specific to the Lighthouse Wind project, except material generally available to the public, and he told me to ask the Sierra Club how it came to its conclusions. Kate Bartholomew never responded to my letter. Instead, Ellen Banks of the Niagara Group of the Sierra Club sent me a note. The Sierra Club’s response did not include a shred of information or even one study that related to or even referenced the Lighthouse Wind project. Not a single one. The materials the Sierra Club reviewed to form its conclusion that the Lighthouse Wind project is “environmentally sound” dated back to 2005. Clearly, if the Sierra Club did not review any detailed information specific to the Lighthouse Wind project and did not review studies and findings related to the Lighthouse Wind project, then the Sierra Club has no basis to offer opinions about the environmental impacts of the Lighthouse Wind project in Somerset. This raises serious concerns about the validity of the Sierra Club and the sincerity of their positions. This was clearly a political endorsement. Did money change hands? How can any legitimate non-profit environmental organization endorse a wildly unpopular project as being “environmentally sound” when it has not even reviewed a single study or report related to the project? The simple answer is, it cannot. This was not an endorsement of a broad state or national policy. It was an endorsement of a single specific project as being “environmentally sound” without reviewing any environmental studies that pertain to the specific project. No one in Somerset is fooled by the games being played by Apex or the Sierra Club. The Sierra Club used to be a responsible advocate for the environment, but has clearly shown itself to be a dealer in “fake science” and “fake endorsements.” In my opinion, this was an intentional and coordinated act by Apex and the Sierra Club intended to mislead and misinform the good people of Somerset and our region. Bats no longer on Sierra Club’s radar. Regrettably, the Sierra Club, in its Another Voice column, has issued egregious errors of fact. 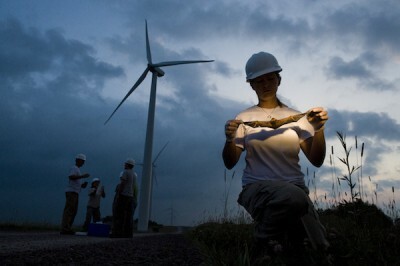 The U.S. does not garner 30 percent of its power from industrial wind. The real number is around 4 percent (some say 8 percent and others, 6.3 percent) and this is often disputed as well, as these heavy fossil fuel constructed and maintained machines also draw conventional power when the wind does not blow, to stabilize, heat and cool. Facts are also: bird and bat kills are voluntarily reported by the industry, and the U.S. Fish and Wildlife Service massively under reports as well. (Actual U.S. numbers are between 13 and 31 million per year.) No other industry has such lax permissions for environmental killing. Developers do not search for areas with fewer nests. They hire technicians even to bury dead and dying birds, and not report. Not clean, not safe, not free by any stretch of the imagination. Each machine contains up to 400 gallons of oil and lubricants, which leak and have to be replenished. In recounting the Oct. 2 information meeting, Sierra Club writes that the developers prepared a list of “no harms: from sound from wind turbines, which is like the hum of an air conditioner,” and that rigorous approvals are being followed. All of these are from the wind developer’s playbook and are not factual. Addressing the issue of harm to humans, ample evidence exists about the cocktail of noise events and ILFN (Infrasound and Low-Frequency Noise) impacts; that people have had to vacate homes, have had cardiac events; and that the unique sound impacts of all kinds are devastating to humans, wildlife, husbanded animals and pets. It is now known that climate will never be positively impacted by industrial wind proliferation, and indeed, turbines may add pressures to those changes, whether warming or cooling. Additionally, the underlying assumption that CO2 levels can be reduced with massive wind turbine proliferation (another claim of the industry) is also false. We are devistated here in Arkwright. Our Town board sold us down the river, never representing we the people. We invite anyone who does not believe the 24/7 torment inflicted by. Wind Turbines to come stay with us. They need to be STOPPED. It is a living hell.